A mole is a small spot, usually dark brown in color, on the skin. 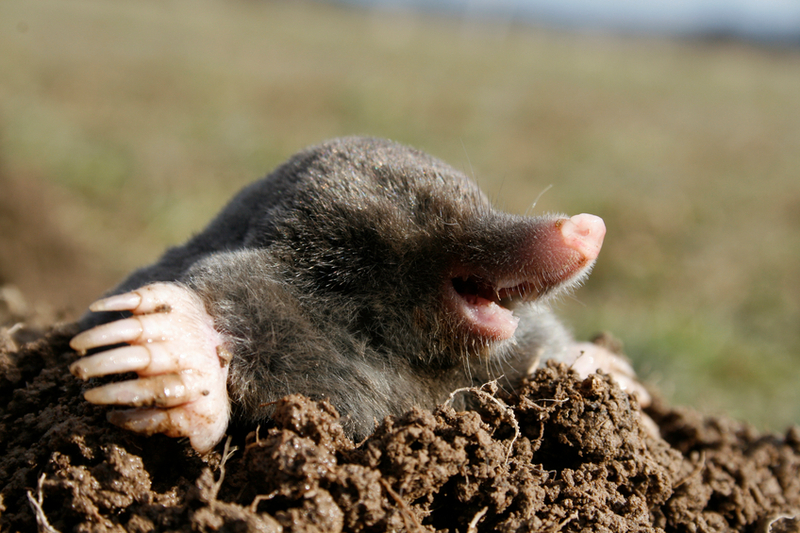 A mole is also an animal that eats insects and lives underground. Figuratively, a mole is a spy working within the organization he or she is spying on. In chemistry, a mole is a way to express quantity. A mole is also a massive structure of stone, set up in the water. You should always watch for any changes in your moles or any new moles that appear as that could be a sign of skin cancer. Mark bought a trap to get rid of the moles in his garden. There must be a mole in this department; someone keeps leaking information. How many moles of this substance are in the mixture? A mole protects the harbor from storms. Mole is also a spicy Mexican sauce flavored with chocolate, usually served with turkey or chicken. With this meaning, the pronunciation is different: mō′lā or mô′le. Mole was suggested by Helen, from Chicago.